Richard has been involved with Cross the Sky Ministries from the beginning. He produced our first project – a cassette of 15 songs on prayer – way back in 1996. Since then he has contributed several songs of worship and added his song-crafting talents in the recording studio. He plays a mean guitar, loves to drum anything and everything, and enjoys the sweet taste of ketchup on his fries. He lives in Strawberry Point, Iowa with his lovely wife Trish and son Sammy. Projects: An excellent collection of songs for congregational worship can be had in Rich’s recent release entitled, “Worldmaking” – 28 original songs written by Rich including hymns, liturgical pieces, chants, rocking praise songs with post-modern sensibilities for the emerging church. Rich has also released a CD of Bible Story Songs for families and kids called “Seeds of Faith” – 18 songs Rich and Trish wrote for Augsburg Fortress Publishing. Includes a Song and Activity/Lesson Book, too. Designed especially for rotation Sunday School. Project: Rich is in the middle of a five year project which he calls, appropriately enough, The Psalm Project. He is writing a congregational song for every Psalm. (Um, that’s one hundred fifty, kids.) Rich says, “I’m loving the discipline of studying each text one by one. The Psalms are so rich with history, passion, honesty. I think they can be a renewing element of passionate worship.” The songs are being released in cycles of the Revised Common Lectionary– CDs, songbooks, CD-Rs. More info is available at Augsburg Fortress online. Central Standard Time is a duo of Christian singer-songwriters from eastern Iowa. Matt Hibbard and Charlie Rod perform and lead both original music of personal faith and popular “camp-style” singalongs. They have performed at churches, camps, campus ministry events, retreats, and Christian coffeehouses, and have led music at lock-ins, weekend retreats, and large-group youth ministry events. They are available for concerts, songleading, or worship leadership. Matt and Charlie met as counselors at EWALU Bible Camp in 1993. They became friends right away, and their musical collaboration began about a year later. Matt and Charlie are pretty nice, all-around swell guys. Charlie enjoys caramel apple pops and sub-freezing temperatures, and Matt likes Twizzlers and being tall. They both love playing and leading music! Occasionally Matt and Charlie are joined by longtime friend and fellow EWALU alum Jesse Klosterboer, who lends his considerable talents on keyboard and bass. Every now and then another friend might contribute some percussion, additional vocals, or just a happy smile! “CST believes in the power of music to spread the good news of Jesus Christ.” say Charlie and Matt, “We sing uplifting, faith-filled music that we believe anyone can relate to.” Both have contributed songs to Cross the Sky Ministries along the way. Charlie is the proud author of the “Oswald Skit” published in “Skit Central” – a resource of 101 new skits from Cross the Sky Ministries. Projects: CST has released three CDs of original acoustic music: Second Whisper (1997), Folksinging (1999), and Lord, Look Down (2002), a compilation of their more obviously Christian-themed music. One of our favorites is “Second Whisper” – an album of catchy melodies, meaningful lyrics, and tight, intertwining harmonies that define the sound of this Iowa folk duo. This is the sort of music cool people listen to when they’re of a mind to be extra-cool. Their most recent one is “christmastime” released in December 2013. It’s a collection of traditional Christmas hymns and a couple of brand new ones arranged for acoustic guitar, voice, and cello. Featuring cello by yo-yo… owner Patrick McAlpine. Mark contributed three original songs to “Step Into the Light” – a CD supporting a youth mime service published by Cross the Sky Ministries. 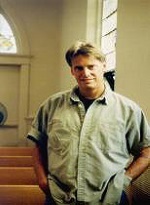 In addition to being the music minister at his church in La Canada, California, Mark is a songwriter-singer who has written over 100 contemporary Christian songs. He has also written 4 liturgical music settings and several choral pieces. Mark has partnered with World Vision as an Artist Associate for his real passion, a ministry that involves going to churches across the country raising awareness of the poor and orphaned children of this world through his music and words. (True religion is this; to care for the orphans and widows in their distress – James 1:27). Through his work as a World Vision Artist associate, Mark has had the chance to meet/learn from artists such as 4-Him, Margaret Becker and Todd Agnew. He is a professional member of the Gospel Music Association and a member of ASCAP. Mark is a solo artist playing guitar and some keyboard. Mark’s music covers everything from praise and worship to ballads to children’s songs to “in-your-face” songs that challenge us to rethink our Christian perspective. “I think we as the Christian church have wandered from the true Jesus. We build new buildings, put in expensive organs, buy church buses and focus inwardly on our own little congregational ministry spaces. Jesus never had a building, an organ or a bus. He commands us to focus our efforts in helping the ‘least of these’. Although we say we want to be like Jesus, I’m not sure we’re prepared for what that means”. Projects: His latest album “Be an Offering” features five beautiful songs of faith that are delightful, authentic and moving. It was produced by 4-time Grammy nominated and multiple Dove Award winning songwriter and producer Margaret Becker. Mark’s music focuses on “the least of these” in our world, and his music resonates with that heartfelt concern for the poor and outcast. He has visited South Africa with several other artists to see first hand the effect of the AIDS/HIV crisis on the continent and how we can infuse hope and caring into the ongoing crisis.